Addison's first Easter was wonderful. 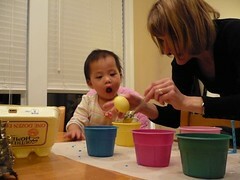 We dyed Easter eggs on Saturday night and she was amazed! She had so much fun THROWING the eggs into the dye cups. We all had colored finger tips by the end of the activity. On Sunday, Granny and Great Grandma had lunch and spent the afternoon with us. Of course they each brought an Easter basket! Her favorite Easter basket treat was a new stuffed duck that quacks. It nows joins Elmo in the crib each night and stays with her throughout the day. She calls him "Duck, Duck!" Click here to see more first Easter pictures.